16 x 16 Inch Captain Seat - SHIPS FREE! 16 x 18 Inch Captain Seat - SHIPS FREE! 18 W x 16 D Inch Wide Seat - SHIPS FREE! 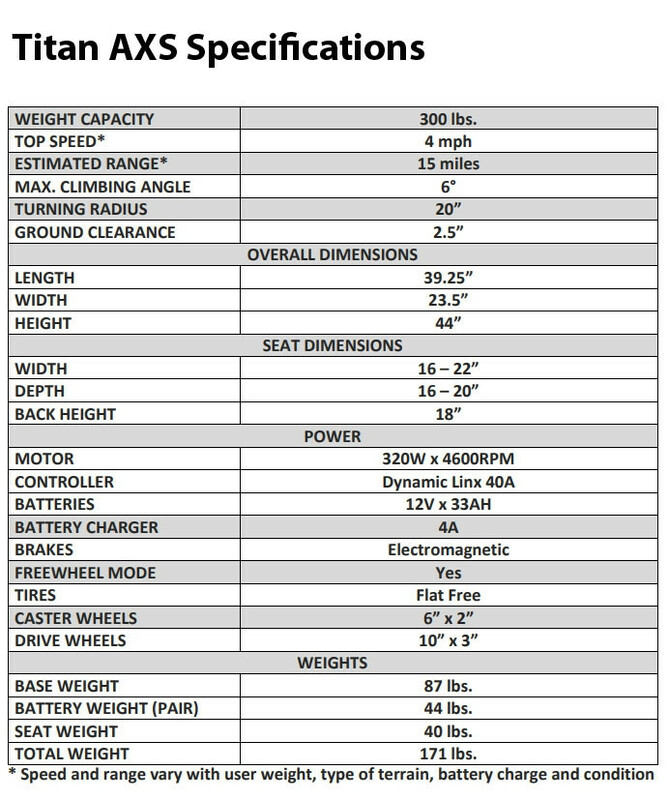 18 W x 18 D Inch Wide Seat - SHIPS FREE! 20 W x 20 D Inch Wide Seat - SHIPS FREE! 20 W x 18 D Inch Wide Seat - SHIPS FREE! 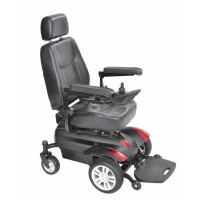 22 W x 20 D Inch Wide Seat - SHIPS FREE! 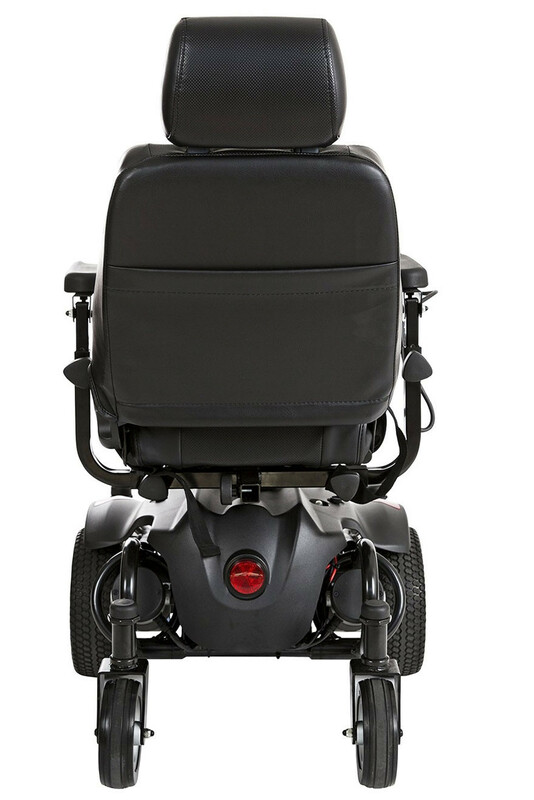 Titan AXS Powerchair comfortably takes you where you want to be--both indoors and out. 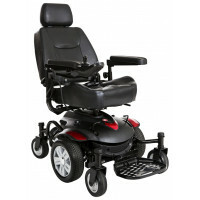 It comes in black with included red and blue panels that can be readily interchanged. 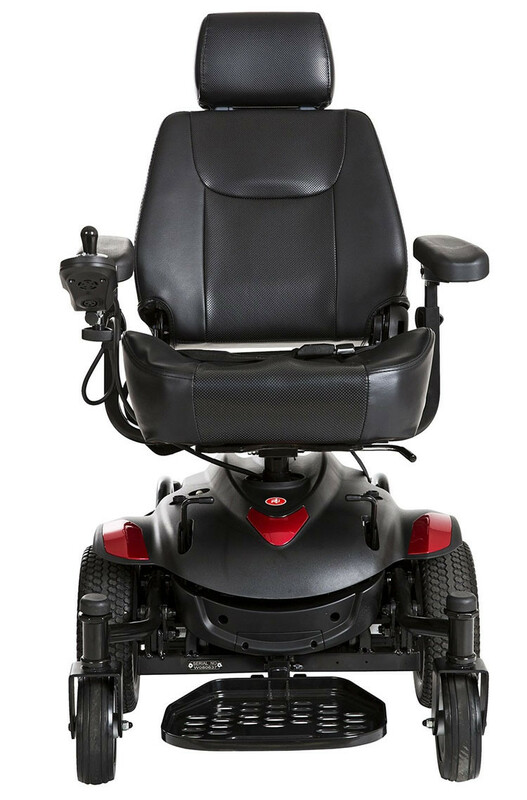 Customize your electric wheelchair by choosing from the variety of captain's chair width and depth seat options that's cushioned and molded to maintain a pleasant seating experience. 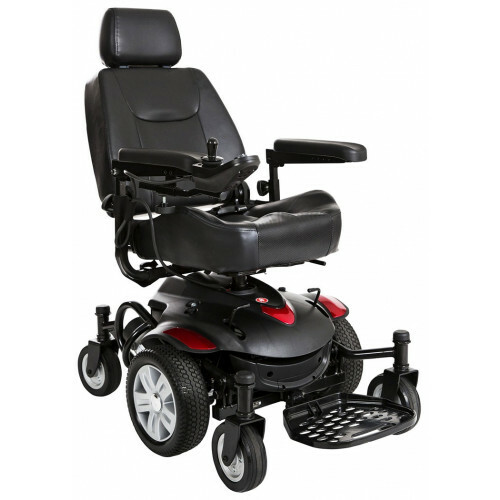 It has a wide range of adjustability and seat can raise, lower, recline and the swivel in 45 degree increments. 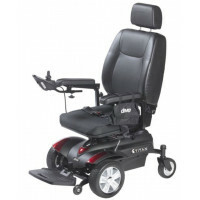 The gliding swivel and swingaway armrests are helpful in assisting safe and easy transfers. The armrests are also beveled and padded with height, width and angle adjustments. 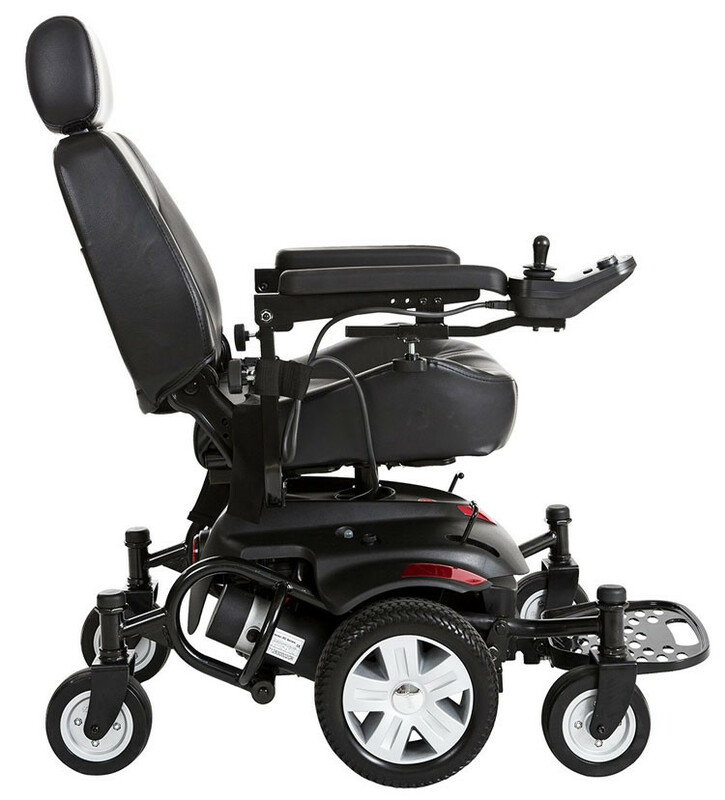 Titan AXS Mid-Wheel Drive Powerchair sets itself apart from other electric wheelchairs with its easy front freewheel navigation with its best-in-class 20 inch turning radius. 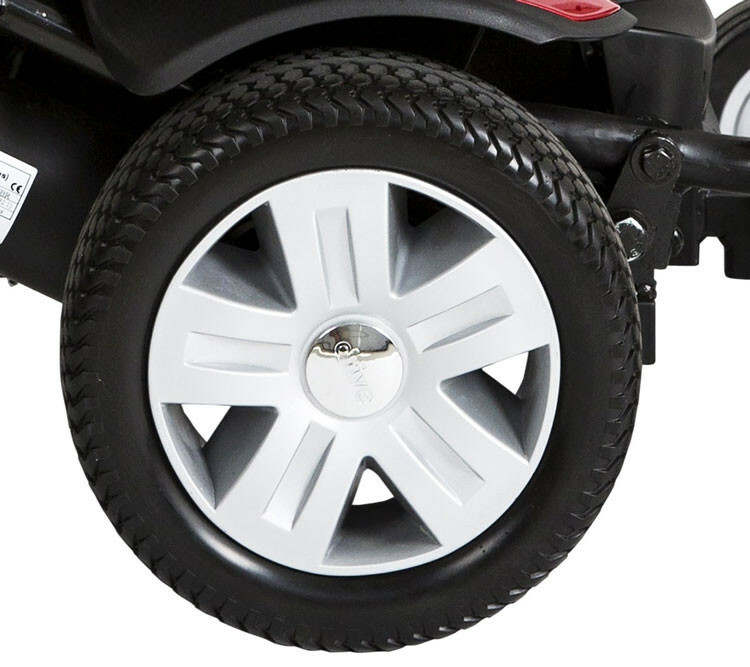 This tight turning capability makes for getting around the house that much easier and takes the stress out of meeting with friends for dinner at a busy restaurant. 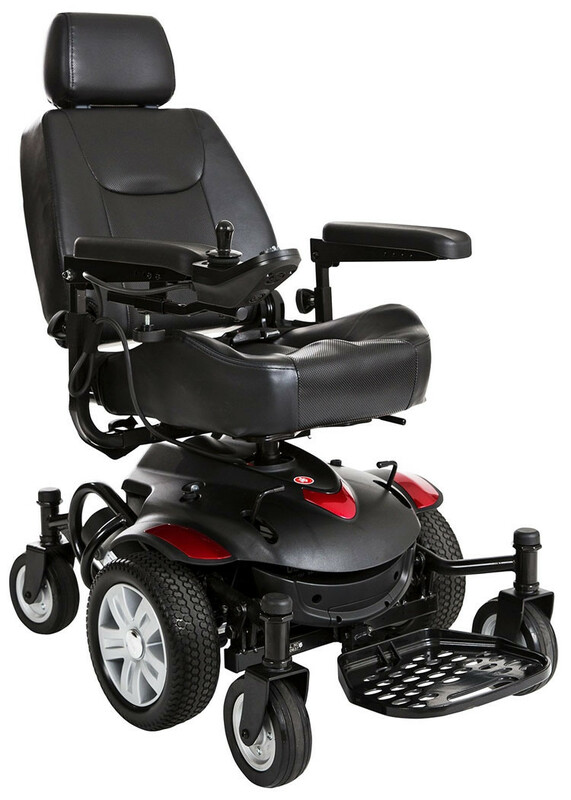 Its maneuverability paired with its stable anti-tip wheels and solid platform creates the ultimate powerchair experience. 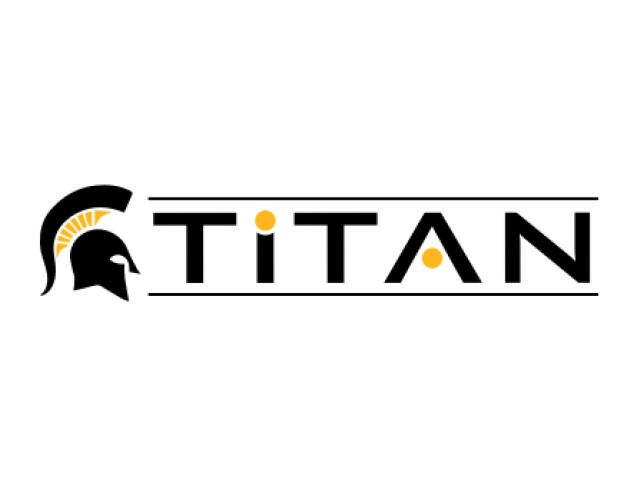 The Titan AXS also features a very important power cord quick-release safety feature. Door handles and other objects can grab onto the power cord connecting to the controller. This quick-release will automatically disconnect preventing potential damage. It easily reconnects so you can go about your day. 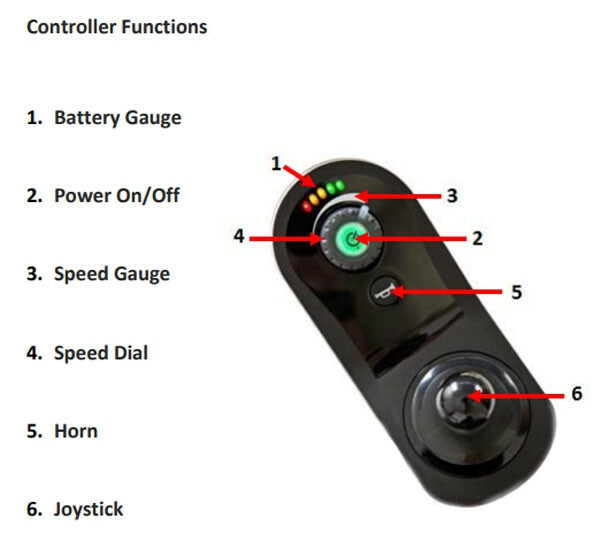 The controller has many other important features as well. 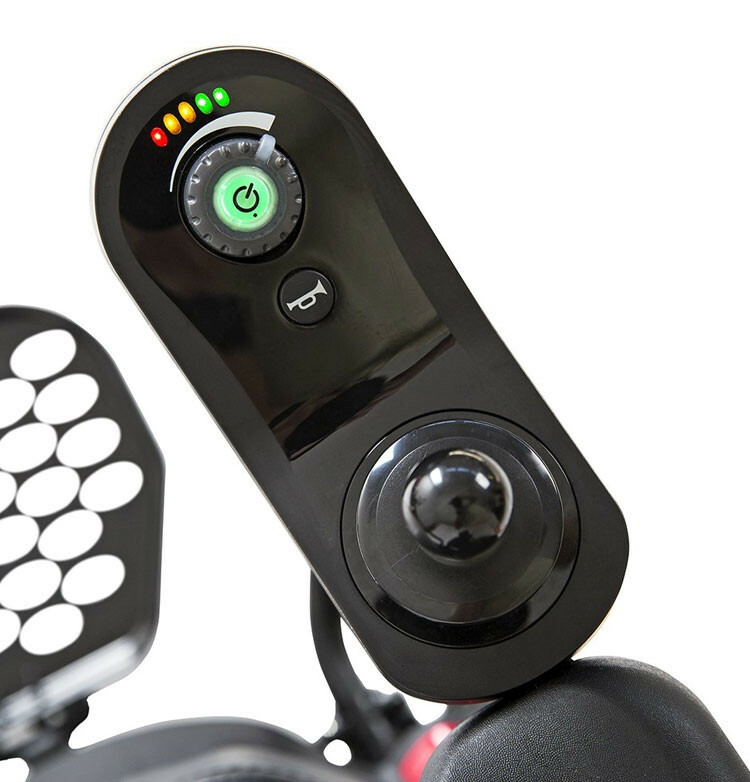 The mount adjusts to the user's arm length for the perfect ergonomic position. 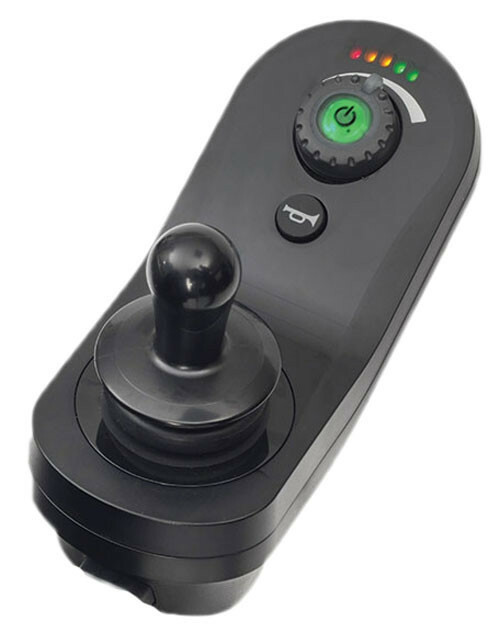 The ultra-responsive controller can be modified to the user's sensitivity as well. 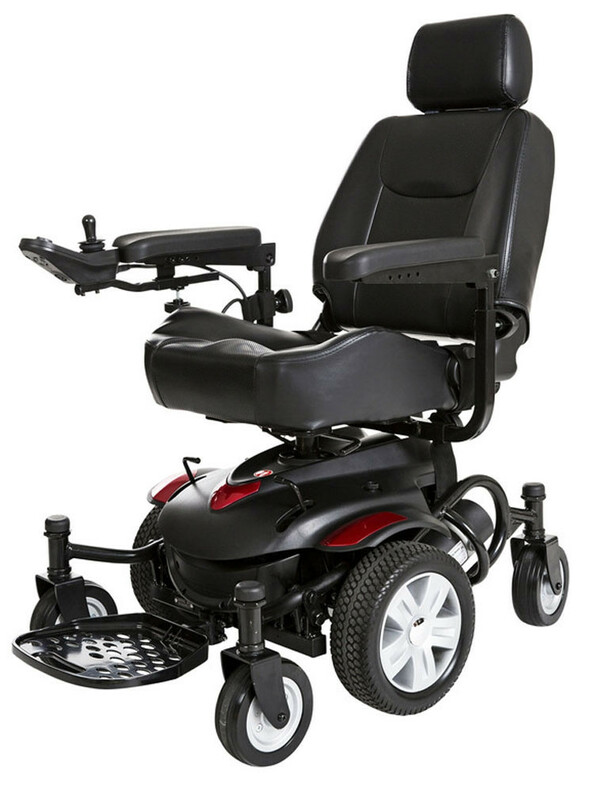 The Titan AXS has an upgrade from its archetype Titan Power Wheelchair with built-in Bluetooth technology to pair it to a device for easy trouble-shooting and service. 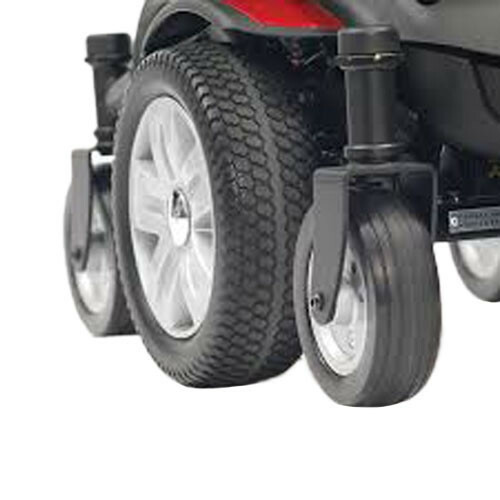 The Titan AXS features a flip-up footplate to keep feet comfortably positioned. 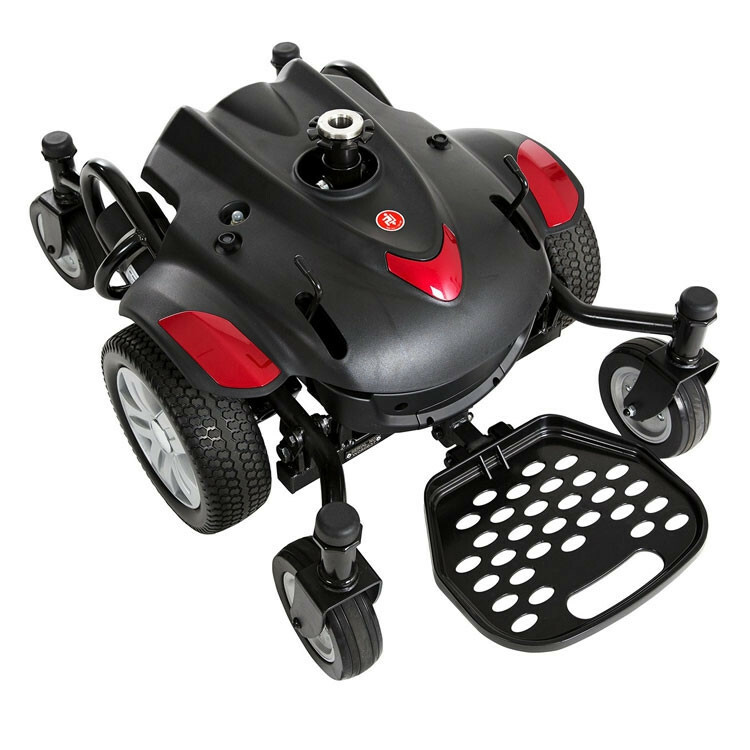 It can be adjusted in height and depth and even has an angle adjustment. Drive Medical added turn knobs for all the adjustment features. 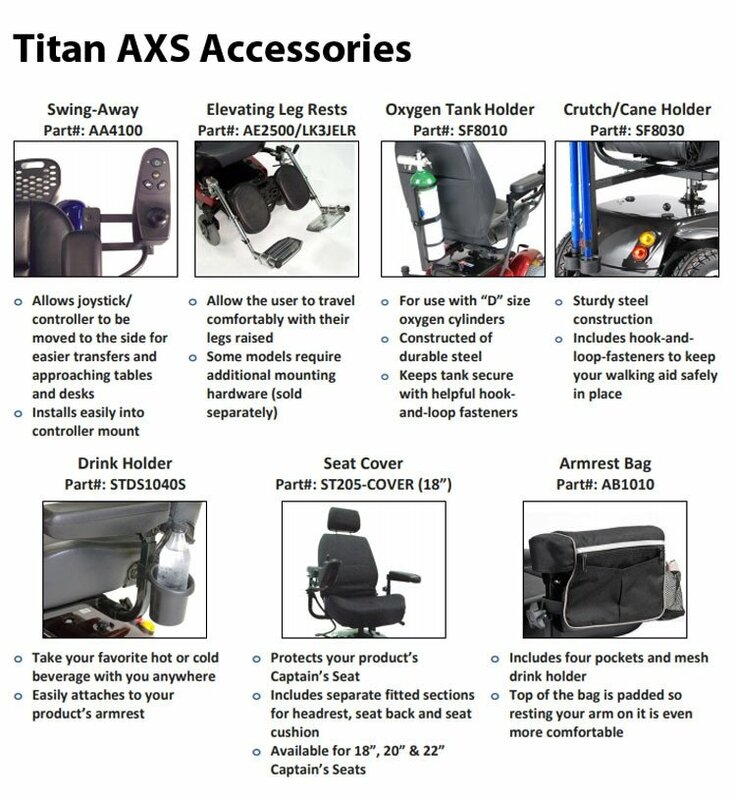 This allows for easy tool-free customization to your Titan AXS Powerchair. 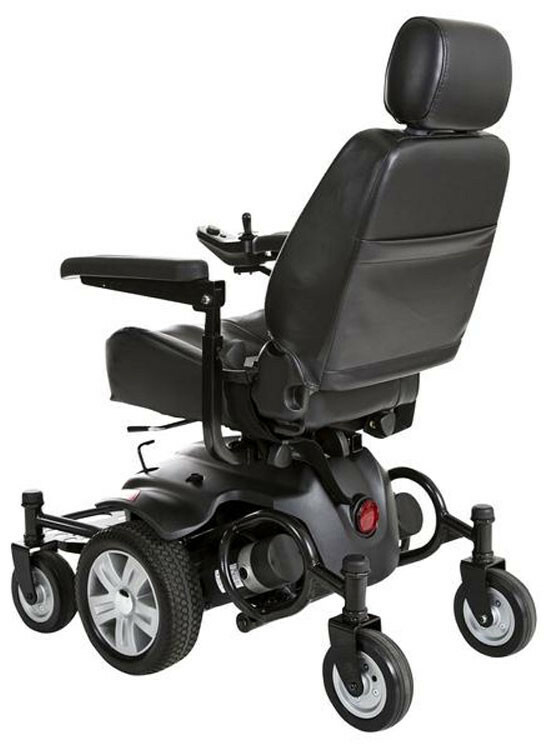 Manufactured by Drive Medical, this manufacturer offers several Titan Electric Wheelchairs to choose from, including the Titan Front Wheel Drive, the Titan Z16, the Titan X23, and the Titan P22. 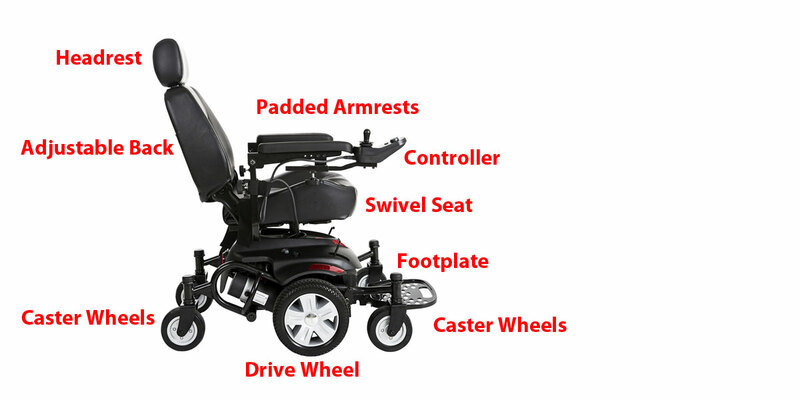 Choose from optional accessories such as Cane/Crutch Holder, Oxygen Tank Holder, Armrest Storage Bag, or Drink Holder. 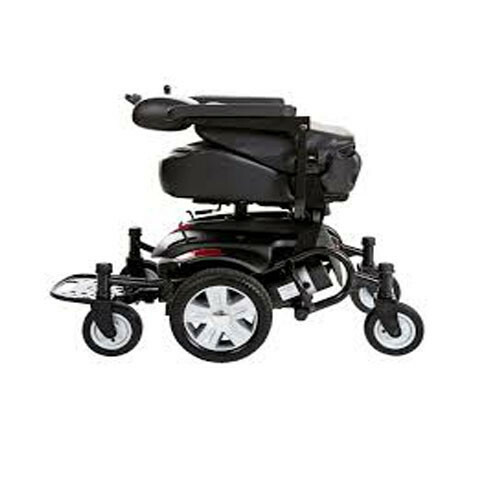 You may also be interested in a wheelchair carrier to transport your power wheelchair on the back of a car, truck or van. 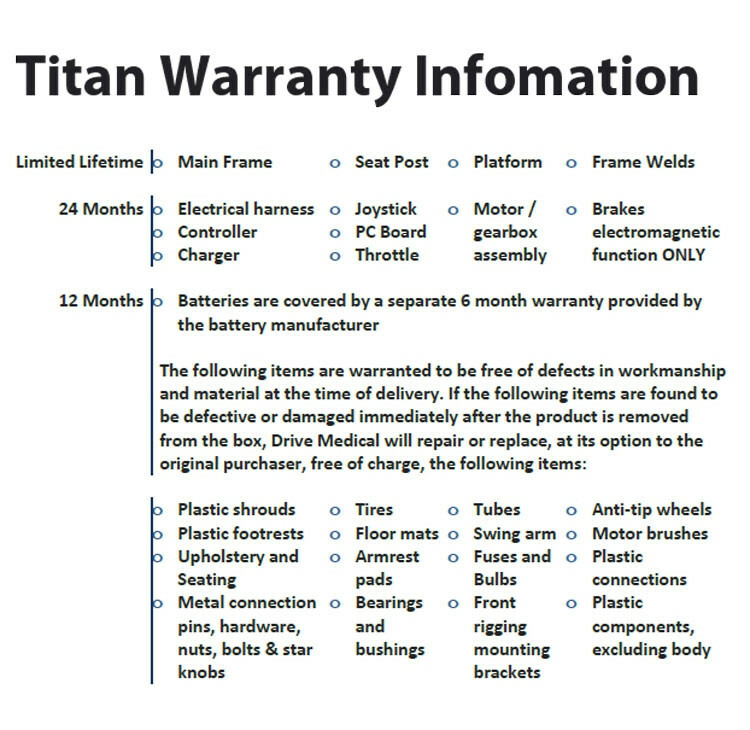 Titan AXS Flyer contains features and benefits for this product. 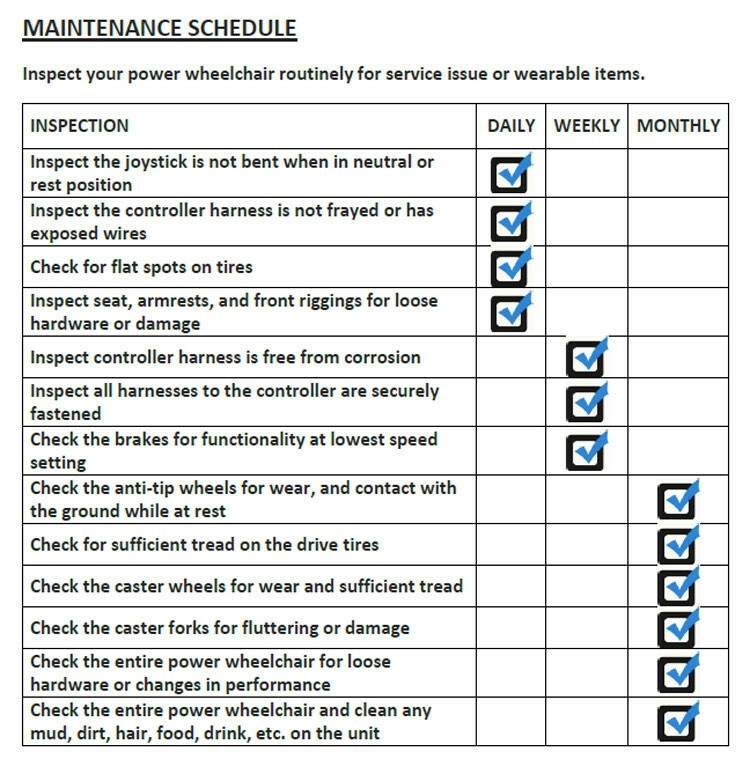 Manual provides user instructions, setup, maintenance and other useful information.